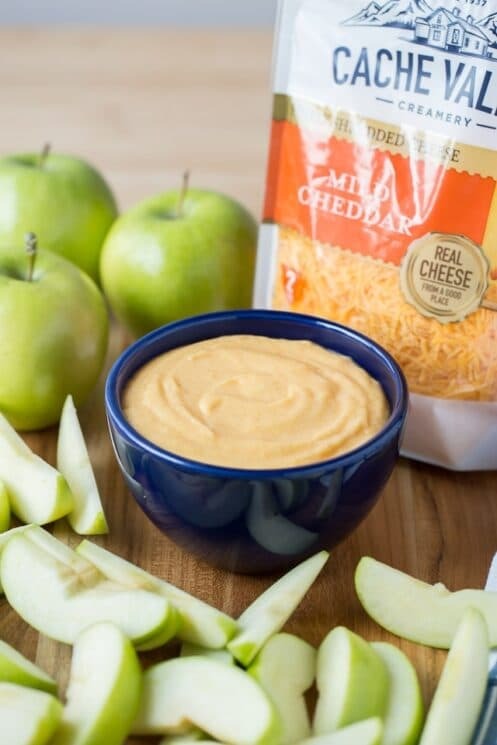 Apples and cheese go together like peas and carrots. 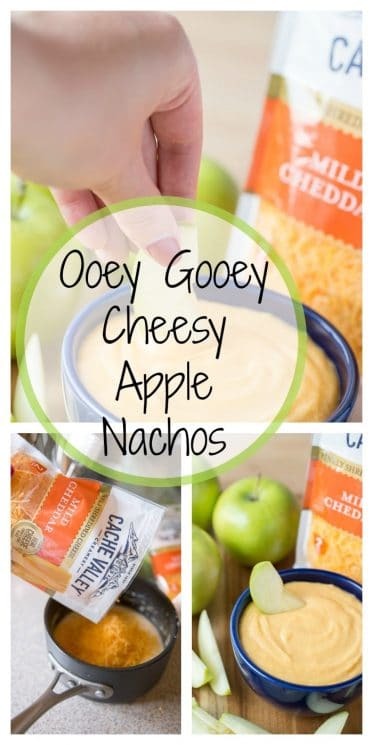 Flavorful cheese and crisp apples make these Ooey Gooey Apple Nachos your kids’ new favorite snack! Even if my kids pack a full lunch for school, they always get home and are SO hungry. I don’t always have time to stop for an hour to bake cookies to have when they walk through the door! Not to mention, that I would like for them to have some good, balanced nutrition if they are going to have a snack before dinner. I love snack ideas that are simple to make, but pack in some good nutrients. These Ooey Gooey Apple Nachos are incredibly simple to make, only have a few ingredients and your kids can definitely be involved in making them! Most people know about wine pairing and which foods go best with which wine, but did you know there is also apple and cheese pairing?? Different apple varieties are more sweet or tart, crispy or soft and those taste better with different cheese varieties. Who knew! In the past, I have definitely been a cheddar and Granny Smith type of girl. But I’m excited to try some of these other combinations. Let’s talk about Cache Valley Creamery for a minute. One of the reasons we love their brand so much is because they are local to us! Cache Valley Utah is an incredibly beautiful place, and they actually get a lot of their inspiration for their products from the people, values and beautiful landscape of the Cache Valley region. They use really high-quality ingredients making their cheese wholesome, rich and flavorful in a variety of products. And a fun new thing – they have redesigned their packaging! It is a really sleek package design and I love it! The white package really stands out and the cheese images make me want to bring them all home! You can find the new packaging at retailers throughout Utah, including Walmart, Smith’s, Macey’s, Fresh Market, and Harmon’s. 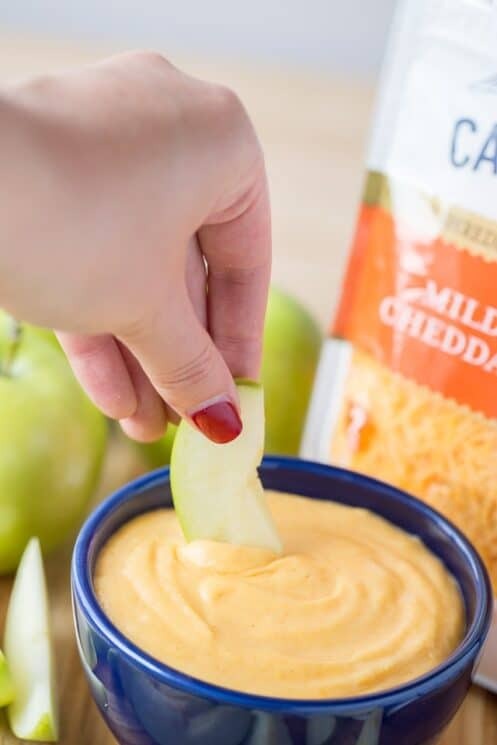 There is just something about the rich, salty flavor of cheese and the sweet tartness of an apple that makes them such an amazing flavor and texture combination. Cheese is definitely best served warm with apples and this recipe takes that a step further. Nachos are such a fun food for kids, but a lot of times serving nacho cheese with salty chips can be a little much. 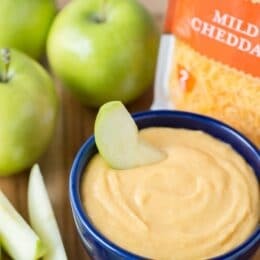 This snack combines elements of vitamins and minerals and fiber from the apple with protein and calcium from the cheese dip. These apple nachos take about 5 minutes to make, which is basically how long my kids are willing to wait once they get home from school! I suggest making the cheese first and then slicing the apples so they don’t go brown. 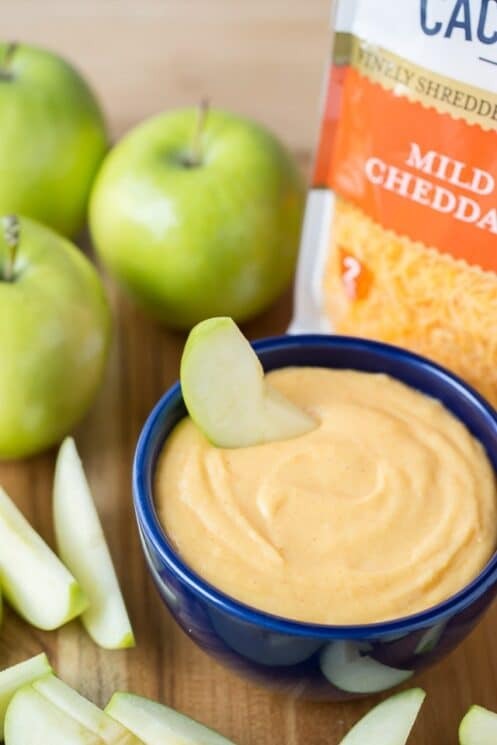 We hope you enjoy this yummy snack as much as our kids did and let us know which apple + cheese flavor combination is your favorite! 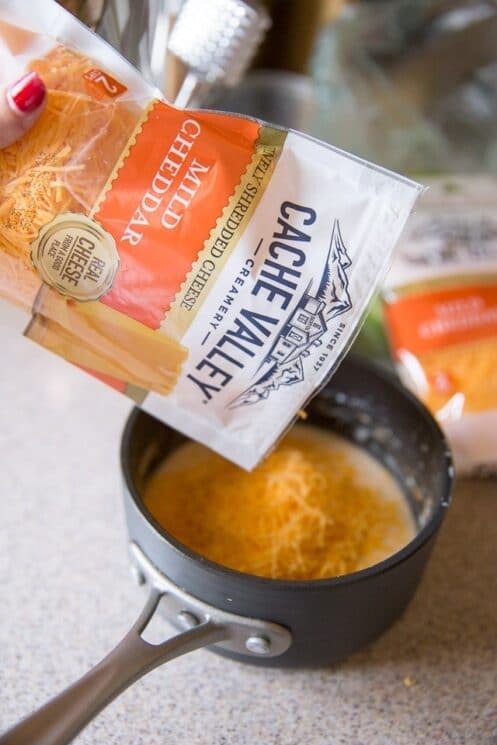 We created this recipe in partnership with Cache Valley® Creamery. All of these opinions are our own. Add the butter and flour in a sauce pot. Heat on medium heat and whisk together until bubbly. Slowly pour milk into the mixture while whisking constantly. Turn the heat up to medium-high and bring to a simmer. Cook while whisking until the mixture is thick enough to coat a spoon. Turn off the heat and stir in the cheese a little at a time until it is all melted. Slice apples into thin slices and serve with the cheese sauce.